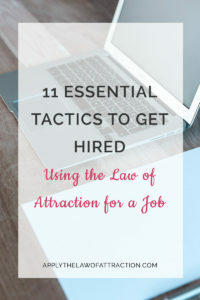 11 Essential Law of Attraction Tactics for a Job - Get Hired! The Law of Attraction can help you land a job, and not just any job, but your dream job. These 11 Law of Attraction job tips can help you find success no matter where you are in your job search. 1. Decide what you want. Get clear on what you want in your job. If you aren’t sure, make a list of the things you don’t want. Then take that list and turn it into positives. For example, if you have “I don’t want to work 80 hours a week” change it to “I only work 40 hours a week or less.” Remember to include your boss, co-workers, commute, and work environment. 2. Remove your doubt. Believe in yourself and have confidence in your ability to get the job. Believe with your very fiber of your being that you will get the job. Hold your head up high and smile. Talk as if you already have the job. Forget about if and when. It’s already yours. 3. Expect the best. Let go of feelings of failure and doubt. Expect that everything will work out in the best way possible. This may take practice, but the more you practice, the easier it will get. 4. Pay attention to how you feel. You create with your feelings. The more opportunities you can find to feel good, joyous, and happy, the faster you will succeed at using the Law of Attraction for your job search. Be grateful for your new job as if you have it now. 5. Pay attention to signs. Keep your eyes and ears open for signs that your job is coming to you and for actions to take. It might be something someone tells you or an email from a recruiter. Take advantage of opportunities when they come. 6. Be committed. Fully commit to getting a job. Be persistent and dedicated. You can’t look for a job with half-hearted hopes that one might come along. You have to decide that you are getting a new job and it is already yours. 7. Take responsibility for the situation you are in. The Law of Attraction starts with you. If you don’t have passion for the work you are doing, you probably won’t do a very good job. You need to stay focused on what matters – you. When you do that, everything else will fall into place. 8. There’s more than enough. There are plenty of jobs for everyone and the right one is coming to you. There are thousands of open positions and more are being created every day. If you get a job, you won’t be taking one away from someone else. And, if someone else gets a job, it isn’t taking one away from you. There are more than enough jobs for everyone. 9. Something better is on its way. If you don’t get a certain job you apply for, remember that it just means something better is coming. Whether you know it or not, there was something about the job that didn’t fit what you were looking for. The Law of Attraction is focused on bringing you your dream job. 10. Take action. The Law of Attraction requires action. You can’t just sit around and do nothing, expecting someone to knock on your door and hand you a job. There is effort involved. You have to look for the job, apply for it, interview for it, and accept it when it’s offered to you. 11. Focus on the outcome. Get into the feeling place of what it would be like to already have the job. How would you feel? Who would you be? What would you do? Find it and hold onto it. Spend as much time of each day as you can there. When you go to bed at night, go to bed with the feeling of already having the job. You have to believe you deserve good things to happen. You have to believe that you can get the job you want. You have to believe that you can land a job with the Law of Attraction. Follow the tips outlined above. With the Law of Attraction, career success can be yours. Get my proven step-by-step system for using the Law of Attraction for money, jobs and more with my book: Law of Attraction and Money: How to Manifest Money and Get Rich…NOW! Thank you for the insightful article. Each time I think that I can’t continue on, that my job is not what I want, that I need something different, I come here and you’ve got something to tell me that puts me back on the right path. Thank you. I’m so glad our site is helping you! Comments like yours make all our work worth it. Enjoy your journey along your path! Your work is worth it. I check your blog daily for inspiration. Don’t stop what you’re doing. I have been looking for from over a year now. I know ‘the secret’ works and I have experienced it earlier but I am not able to feel same in case of getting a job. I read your blog and be happy for a day or two but then again I feel bit low and end up reading your blog over n over again. Its not easy to be optimistic and happy all the time. It’s common to experience highs and lows. These often are signs of limiting beliefs and resistance cropping up. Try doing different things that put you in a better mood. It doesn’t have to just be about a job, but a better mood in general will help you create a new job. Listen to music you enjoy. Go for a walk. Just do something that makes you happy as often as possible. I’m glad it helped, Cindy! thanks very much for this article I am in the midst of struggle trying to find a job that suits me. I realized that I’ve been very pessimitic most of the time having frustrations of not finding a job. From now on I’ll use this law of attraction and see what success will happen. thanks a lot! You’re welcome eshi! I’m glad you were able to identify some of your blocks. SO thankful for your blog. Sometimes I get confused with the law of resistance though. You mentioned we must feel/act like we already have a job but at the same time we have to take action towards getting it. My question is that if I apply and search for jobs, will that create a lack of having a job? How do I act like I already have it while taking the action steps of applying for a job? It won’t create create lack of having a job on its own. You would have to project that energy to create lack. I am really frustrated with my current job and am looking for a change. I applied to many companies & job portals but for some reason I am not getting a call. Also, I tried applying secret in my life, but still I am not able to apply it becoz of situation in office. If I write a wish list , do I have to write it everyday or I have to write it once? I know you don’t respond to comments anymore, but I must say this: I have been job searching since May and I have applied to many different places. I feel like I have left a bunch of paths for a job to enter my life. I think sometimes we have to let go because I was reflecting on my past when I was called back for a job and I remember two distinct times when I was called back and it was when I forgot about the jobs and I basically gave up. I have been persistent since May and it has grown tiring, now I have chosen to focus only on feeling good and only apply to jobs when I feel inspired to. I just applied for three jobs today, but I’m not applying anymore. I have chosen to feel good because I think it is quite possible that sending out good vibrations will attract an employer I applied to a few months ago to call me for an interview. I really enjoy reading your website, it is so informative. Elizabeth talks about doing those things elsewhere. I don’t remember the exact posts, but they’re about inspired action and feeling good. It should work for you. Good luck! hi. I hope you can help. I am 45 and need quidence to find my dream job . I feel as if I don’t decerve the job because of my age and looks. I try to be positive .when I think about my dream job I get butterflies. I also have started scripting hoping that will help.